In a post a while back, I shared the history of my salary as I grew into a career in the tech industry. For the last 7 years I have moved into having a ton of class privilege and I’ve wanted to write this post for a long time to share my strategy for one of the ways I try to give back as someone with more money resources. I share this also as a way to hold myself accountable using actual data instead of vagueness. When left to vagueness even my best intentions don’t add up to how much I believe I should be giving – when I do my taxes at the end of the year, I am surprised that I didn’t give away as much as I felt I did. Some of the money I give away isn’t to typical charities but I know that if I was to go back and add it all up, I’d still fall short of what I want to be giving. 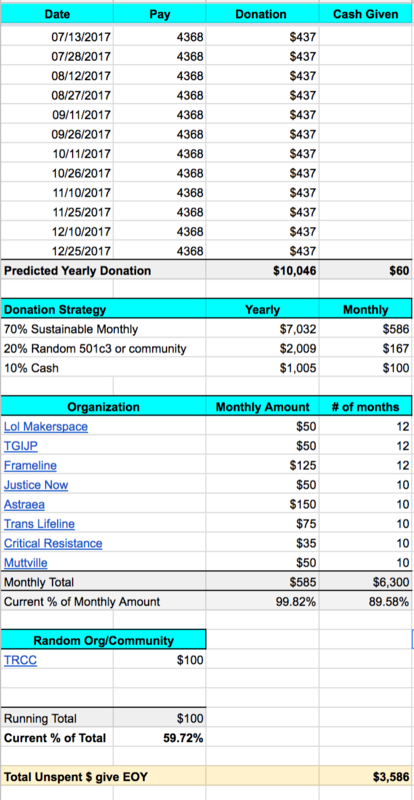 I’ve created a spreadsheet where I can track my donations month over month and make sure I’m holding up my commitment to my strategy and so that, at the end of this year, I will know exactly how much I have to hand over to complete my plan. It’s a simple strategy, based on doing 10% tithing of my post-tax income. I want to put the bulk of it into sustaining monthly contributions as those help organizations plan longer term projects and then I have two categories for ‘unplanned’ giving: random 501c3 organizations (or whatever local community member/gofundme comes up) and then the second is for cash in hand to share with people on the street (most often in SoMa where I work). I’ve published the spreadsheet so that anyone who is interested can follow along. It will update as I add more data throughout the year. 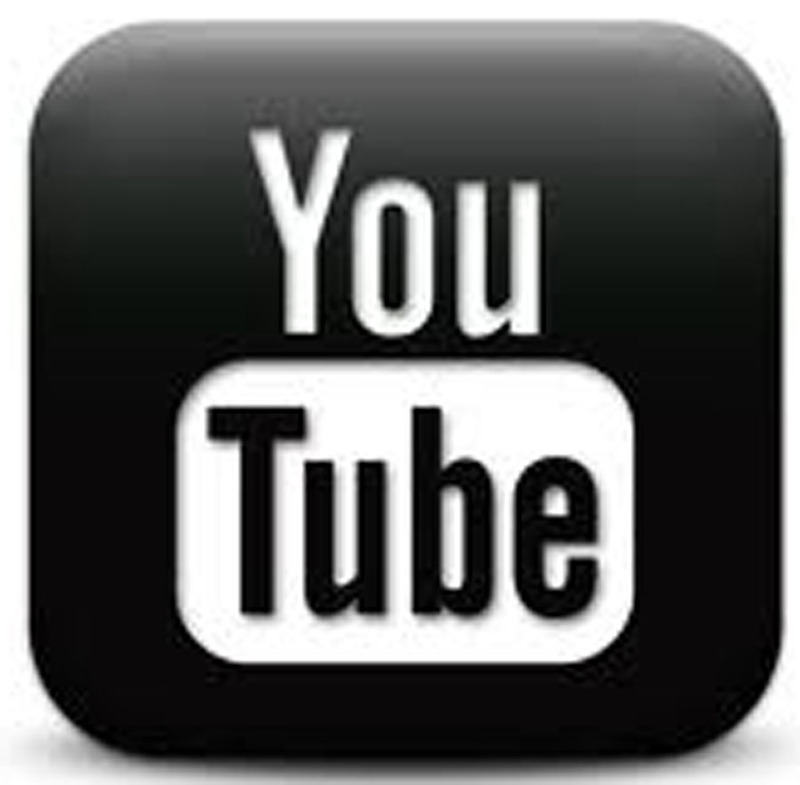 Click on the image below to go to the published page. I’m interested in hearing how you donate money, what your strategies are, how you track yourself — what’s missing from this year’s plan that I hope to work into future years is: how could I take some of this money and put it into investments or other ways of growing the principal so that more money can be made from that money to give away? I was talking with Damien about this at Lesbians Who Tech and it was the first time that idea came up but now I’m intrigued. How can those of us without family money/major inheritances find ways to build wealth and create trusts & grants that can persist beyond our lifetimes? Big questions. Today, I’m just going to start with finally publishing my 2017 plan. Other ways of giving back include advising and sitting on boards, leveraging my company’s space and budget to assist non-profits, spreading the word around my networks to get increased visibility for fundraising, and volunteering my time with several programs of my own creation and also more traditional existing ones.